Retro Candy Kid is live! The game is currently available on the iOS App Store and Android Google Play. Additional platforms include: Amazon for Android/Kindle, Amazon for PC, itch.io for PC and Indie City. 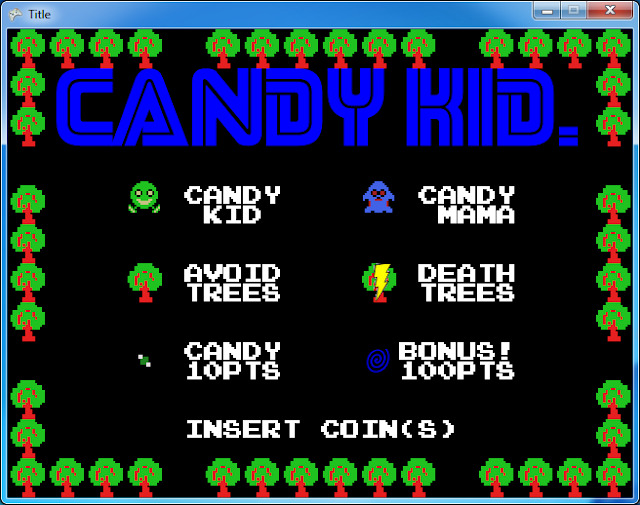 Click here for more information on Candy Kid "How to Play" which includes secrets, hints, tips n' tricks! 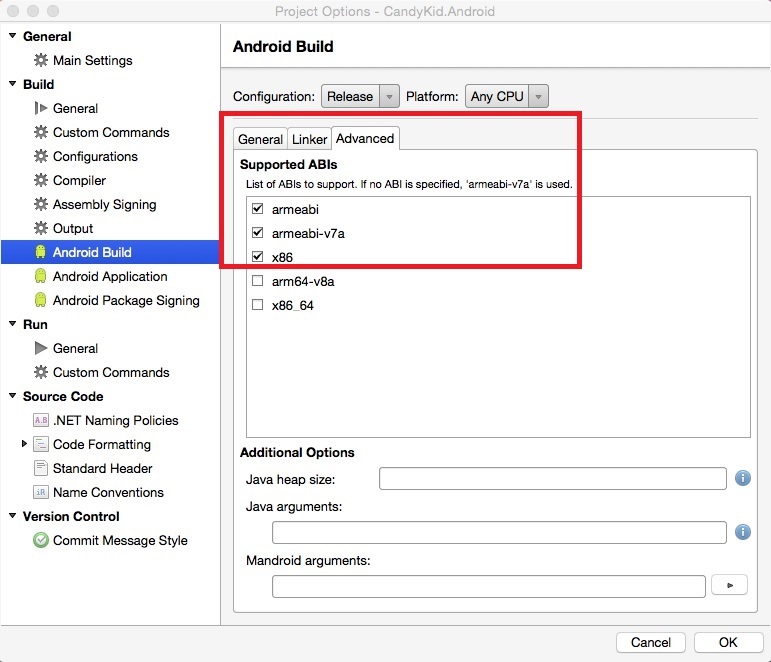 UPDATE: Android OS 6.0.1 release seems to cause an issue with 64-bit architectures ABIs + may throw FATAL UNHANDLED EXCEPTION: NoAudioHardwareException: OpenAL drivers could not be found. 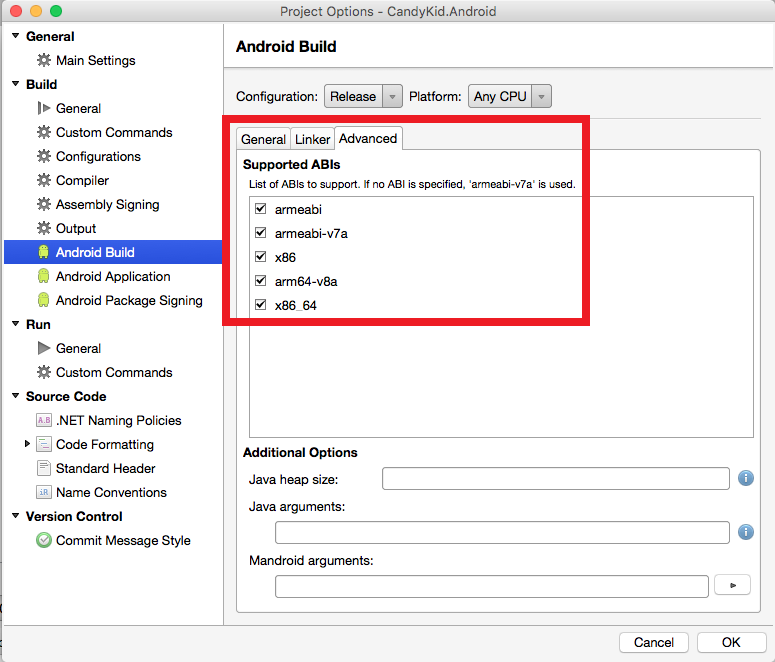 In Xamarin Studio, right click project. Choose Options | iOS Build. 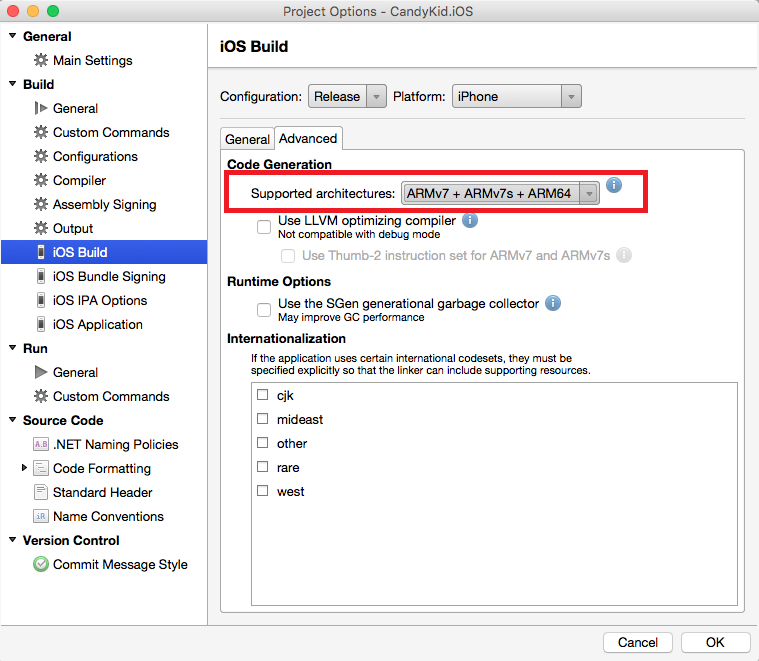 Ensure all 3x Supported architectures are checked: ARMv7 + ARMv7s + ARM64. Also, configure correct distribution signing identity + profile. Previous posts on Candy Kid port to iOS / Android end with deployment process: Archive for Publishing. Let's complete the deployment process: document signing the application and publishing to the stores. Android References: Signing the Android Application package and Publishing Application to Google Play. iOS Reference: Publishing to the App Store. Includes information to create and install Distribution Profile. Choose a unique game title, short description and bullet points to be applied consistently across stores. Full description * Eat all candy in maze to pass each level. * Eat bonus optional but increases score. * Avoid 3x Candy Mamas who chase you. * Avoid trees (Death trees kill on contact). Check out each platform: different resolutions for box art images, promotional screen shots, icons etc. 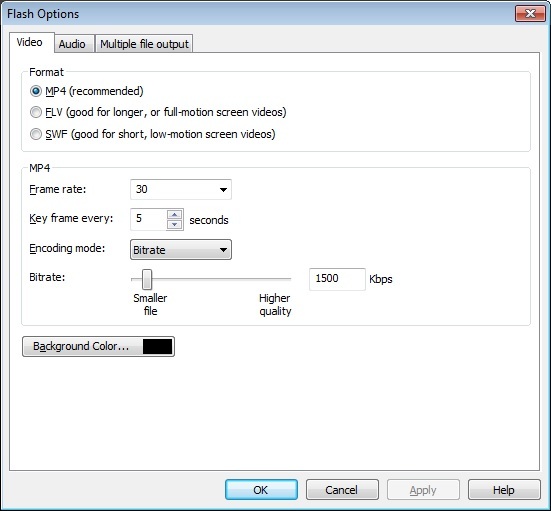 If you develop on Windows then most platforms accept MP4 videos that can be uploaded to You Tube. Good idea to crop the window borders especially on Apple otherwise you may be Metadata Rejected! Record 30s MP4 video for e.g. 4-inch iOS Device. Launch Camtasia | Drag MP4 file into Clip Bin twice. Project Settings | Recording Dimensions | 1136x640 | Ok. Produce video: Custom Settings 1136x640. 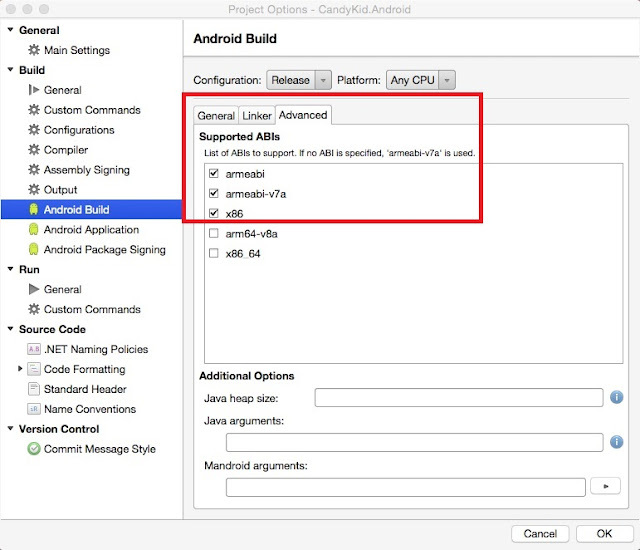 Most platforms such as Google Play Developer Console allow you to enter the Developer name, i.e. Name other than your legal birth name to represent your Indie Game Studio e.g. StevePro Studios. This is what appears on iTunes; to change this as Company name then you need D-U-N-S Number. Finally, Apple will not publish your game until you have completed "Agreements, Tax, and Banking". Entering Contact and Bank Info is clear but Tax Info may be more challenging for non-U.S. citizens! Under Tax Info | U.S Tax Forms, there is option to enter US Tax ID. Non-U.S. citizens may apply for an ITIN if their country has a tax treaty with the U.S. thus in order to claim a reduction in U.S. income tax. Link to complete Part II "Claim of Tax Treaty Benefits". Answers very similar to Microsoft "XNA and Tax"
The beneficial owner is claiming the provisions of Article 12 of the treaty identified on line 9a above to claim a 0% rate of withholding on (specify type of income): Royalties. I am a XXXX citizen and resident of XXXX receiving royalties from U.S. source. Also, if you do apply for an ITIN (above) then you can re-use if/when you publish to Amazon AppStore! 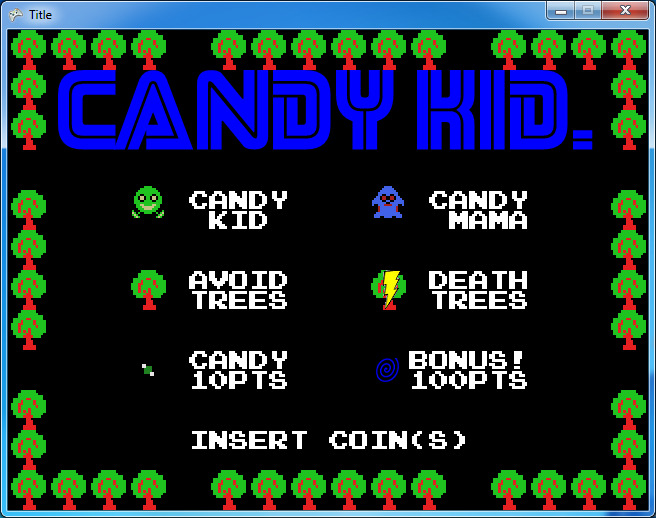 Please show your support for Retro Games and buy Candy Kid today! Now available on iOS and Android.